Container garden annuals will be the showy members of your designs. They provide the most color and impact from the moment they are planted. Plant them alone, or tuck a few in with your shorter blooming perennials, or with your herb or vegetable containers. Use them to underplant shrubs and trees in containers for a colorful display. Here are some of the best container garden annuals for use in your potted gardens. some of your favorites, but maybe some you haven’t tried. My favorite sun annuals are any of the daisies, snapdragons, verbena and lantana. 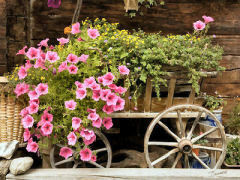 I also like geraniums because they provide a lot of color. In shady areas, I like coleus, impatiens, lobelia and moneywort. I also use a lot of ivy and sweet potato vines. Ivy comes in lots of variations in color and leaf size. Sweet potato vines can be found in colors from lime green to dark purple. They both are easy to grow and thrive just about anywhere. When you purchase annuals for container gardens, their planting instructions indicate whether the plants need full sun, partial sun, or partial sun/shade to grow best. Full sun is expected to be at least 6 hours of sun per day. Partial sun is a requirement of 3-6 hours per day. Partial sun / shade would be filtered or dappled sunlight throughout the day. begonias and geraniums indoors to use as houseplants during the winter. For more about shade gardening with containers. . . . These are just a few of many annuals that you can try in your container gardens. For more recommendations, go to gardens.org. You can refine your search by your growing region, type of plant “annual” and then continue to refine by the parameters that follow – color, water requirements, height, spread, etc.